The quiet, cushion and warmth of carpet softens your home and makes it more inviting. Carpet fits any decorating style, too. We can help you find the color and pattern for your room’s personality and the right height, weave and pad for your living needs. Many more carpets come with stain-resistant properties so you can live with your flooring! Check out Smart Strand from Mohawk Industries. It’s economical and easy on the environment. It’s made with a renewable source polymer grown in America. The derivative of corn sugar in its main carpet fiber requires less energy to produce, which means fewer greenhouse gas emissions for our planet. 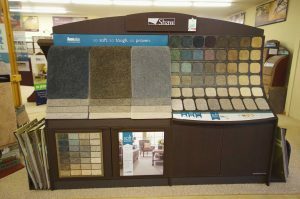 At Menomonie Flooring Centre we have a large selection of carpet samples from the country’s leading and most reliable carpet manufacturers. Experiment with different looks and styles in your home before you buy.